Sarah is a Southern Belle that was recently transplanted to Orange County California. She has a love for fashion, decor and wedding planning along with a super cute hubby! Hello, my name is Sarah Ring and my blog is called Jeune Marie. While Camila is away, I am taking part of her guest blogger series "5 items to spruce up your home for under $25". Since I am a budget decorator in my own home, I would like to share with you my personal tips on how to achieve a fresh look for a fraction of the cost! No. 1 - Your home is only as pretty as it smells. Sure you may have a gorgeous home, but if it smells like a garbage can no one will want to spend time in it. 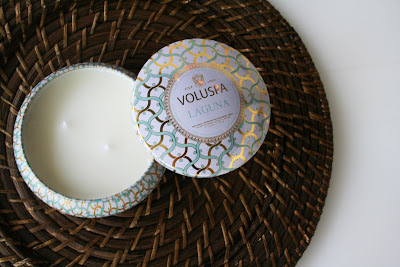 Candles by Volupsa come in pretty tins for $18 and are available at Anthropologie. No. 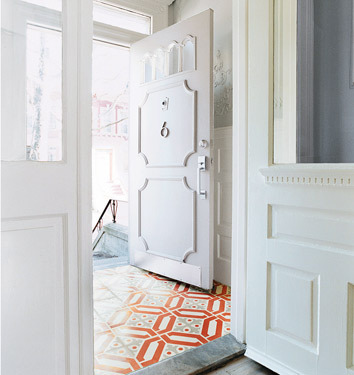 2 - House numbers are a small way to make a big first impression. I like the contrast of the modern house number against the traditional door, a warm welcome for $14 at Chiasso. No. 3 - While your budget may not have room for a sofa upholstered in designer fabric, an affordable alternative is throw pillows. Premium fabrics can be found for around $25 per yard, enough to make two pillow fronts (use an inexpensive linen for the backs). No. 4 - Gallery walls make a huge impression and I love using the wallet friendly Ribba frames to display my family photos for all to see. Frames from $9.99 to $24.99 at Ikea. No. 5 - Paint it! The most inexpensive way to spruce up your home is paint, a gallon for around $25 can transform an entire room into something completely new. Thank you for having me HHITFD readers, I hope you visit me at Jeune Marie very soon! Great post! All very necessary things when it comes to making a house a home. I'm a big fan of the La Jeune Marie blog. Great things you've found. I like the paint the best. You know, I never thought about it... but smell does make a huge difference in the overall feeling of a home. The smell of baking cookies makes a home feel warm and cozy. The scent of flowers makes a home feel fresh and springy. That atmosphere really does impact the people inside! These are all great finds... But mostly, I am in love with Voluspa! They're candles are like a little bit of heaven each time I smell them. fantastic!! love all the picks! I'm a huge fan of creating galleries...they personalize and elevate a home. I especially like them in a kitchen or a hallway. Great pick on the frames. The Chiasso door numbers are great too. I always look at them in the catalog. Loving all the ideas on here. I'm moving soon and totally need to update some throw pillows! i LOVE the house number idea. how clever! i wouldn't have thought of that for one of these lists but they are perfect — especially for $14! Where High-Gloss Blue finds inspirations!